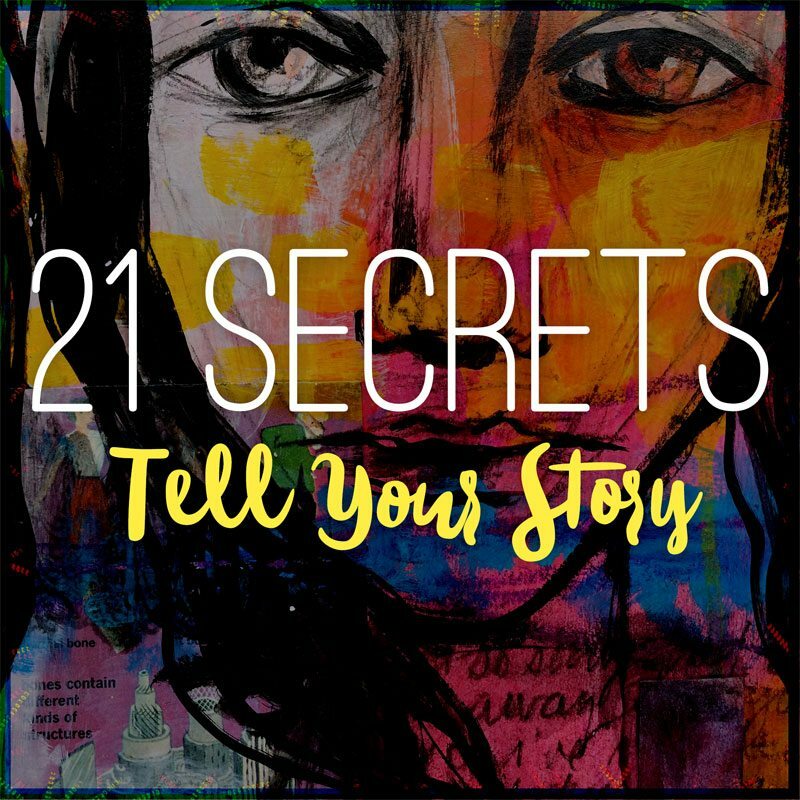 In short, 21 SECRETS is a 150+ page downloadable eBook filled with 25+ hours of videos, full colored photos, templates, and clear instruction that will inspire and deepen the way you approach art journaling. 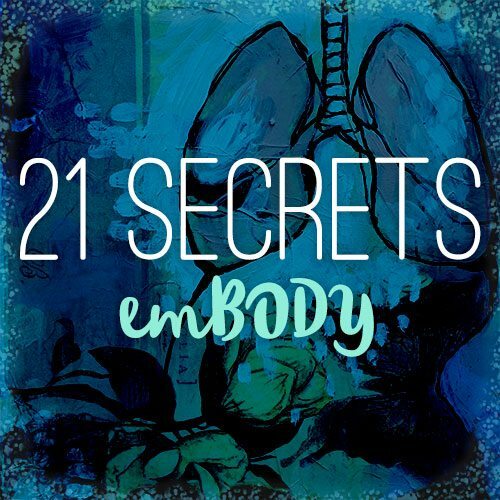 What makes 21 SECRETS even more special is that you receive all the content at once — YOU get to pick and choose which workshops to do when! No waiting around for your favorites and no need to feel rushed or falling behind — these workshops are YOURS TO KEEP! Purchase NOW & receive instant access to all 21 workshops. 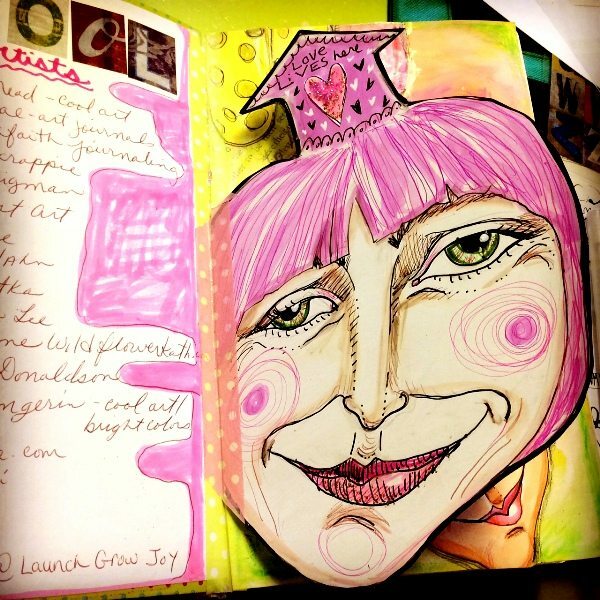 I want to teach you how to approach your art journaling in an intuitive way that encourages play and wonder. 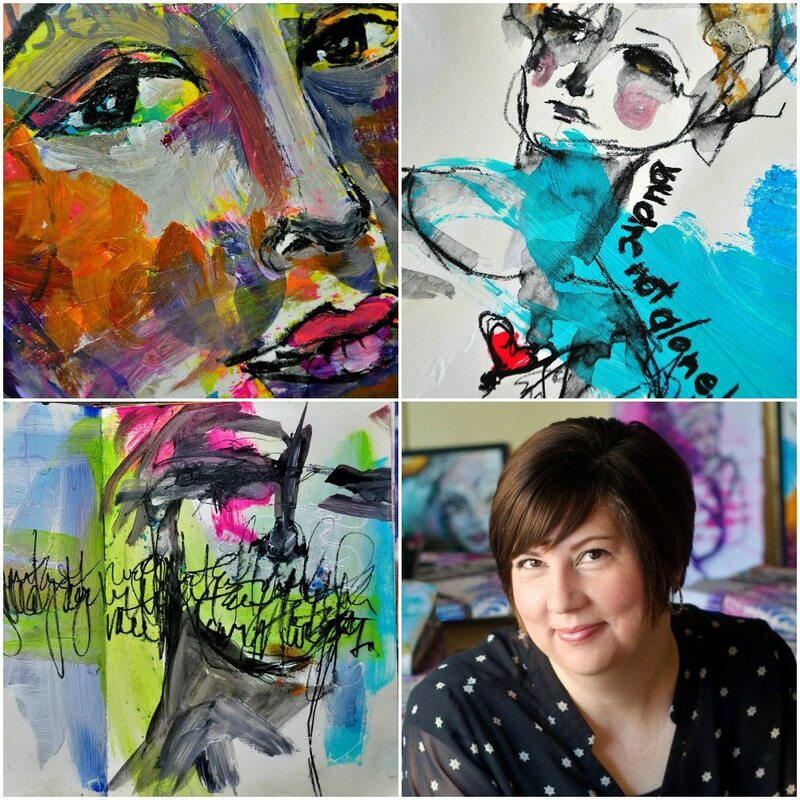 I think of my art journal as my “artistic playground,” and I hope you will too. 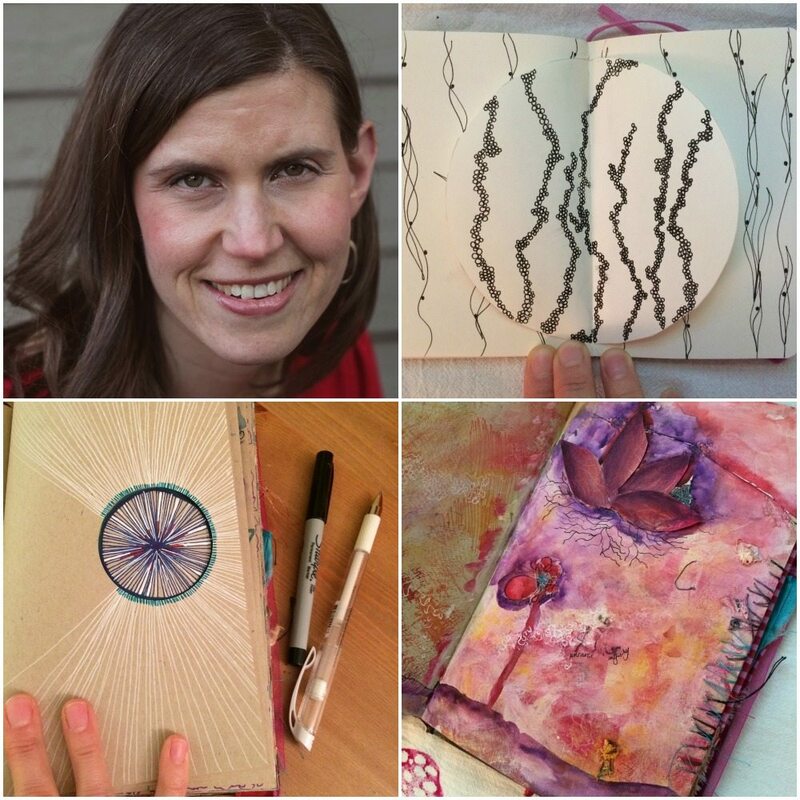 You can explore countless techniques, materials, and art forms in your journal. Each page can evolve slowly over time, with less pressure to make art that is “perfect,” and more focus on what “feels right.” In my experience, when I open myself to my instincts, and become a channel for the art, rather than a director, my art becomes more fluid and meaningful. Playing with interactive elements like windows, doors, flaps, and pockets gives you more “toys” in your playground. Imagine a letter tucked into a pocket in the midst of a raging sea, layers of color sewn into a page to create depth, or opening to a mandala page that actually is made of several pages. I have a large basketful of found objects made of polystyrene, plastic, metal, wood, paper and other materials that I use as stamps, stencils and glued objects to create works of art from. I also have boxes filled with shopping tags sorted by color that are my favorite for creating collages and backgrounds with. 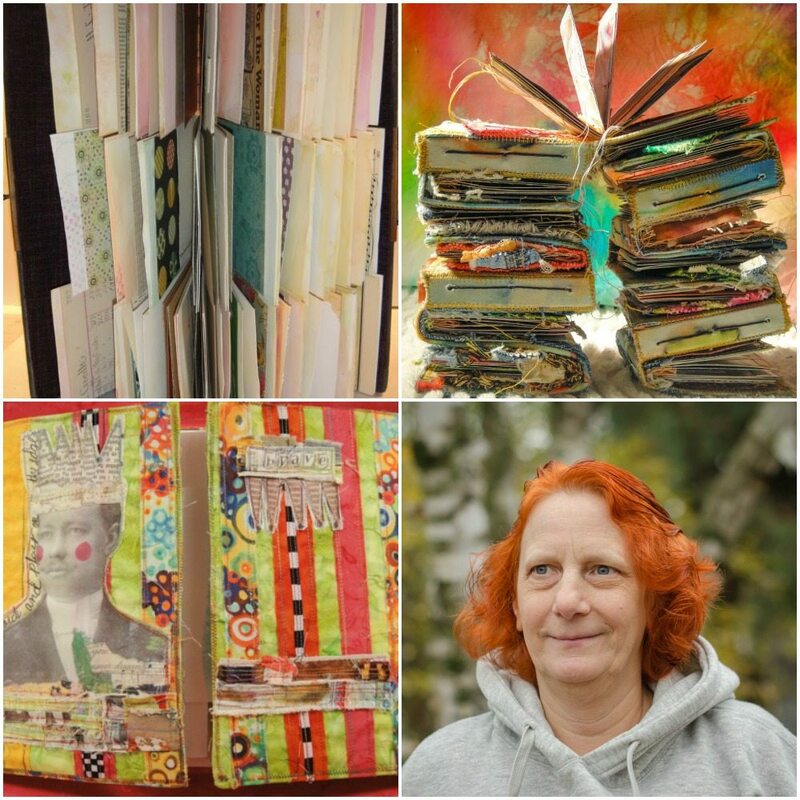 In Creating With Found Objects I’ll pull out these found treasures and together we’ll discuss collecting, storing and sorting various found objects, and how to use them for creating works of art. Use these yummy fun and unconventional objects to create multi-layered backgrounds. Then finish it off by painting a face using acrylics over one of the found object backgrounds. Let’s make something out of nothing! 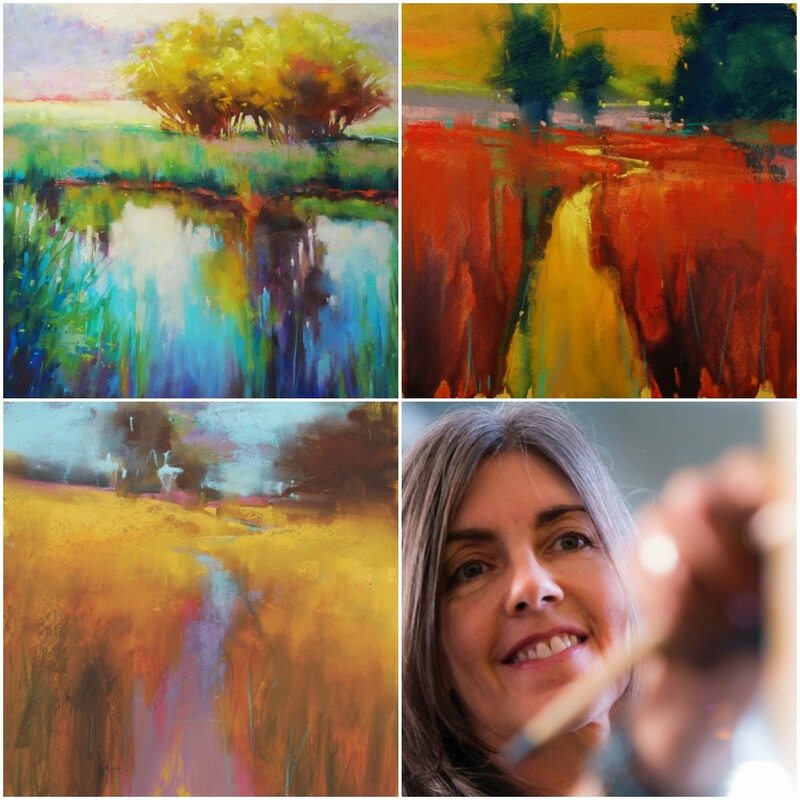 Learning to layer watercolors and fluid acrylics to create depth in a piece of artwork can seem daunting, but this workshop will show you the steps to create dynamic light and depth using simple products and simple steps. We will go down the rabbit hole of whimsy and find the magic in bringing the light out of darkness with pigment and glazes. 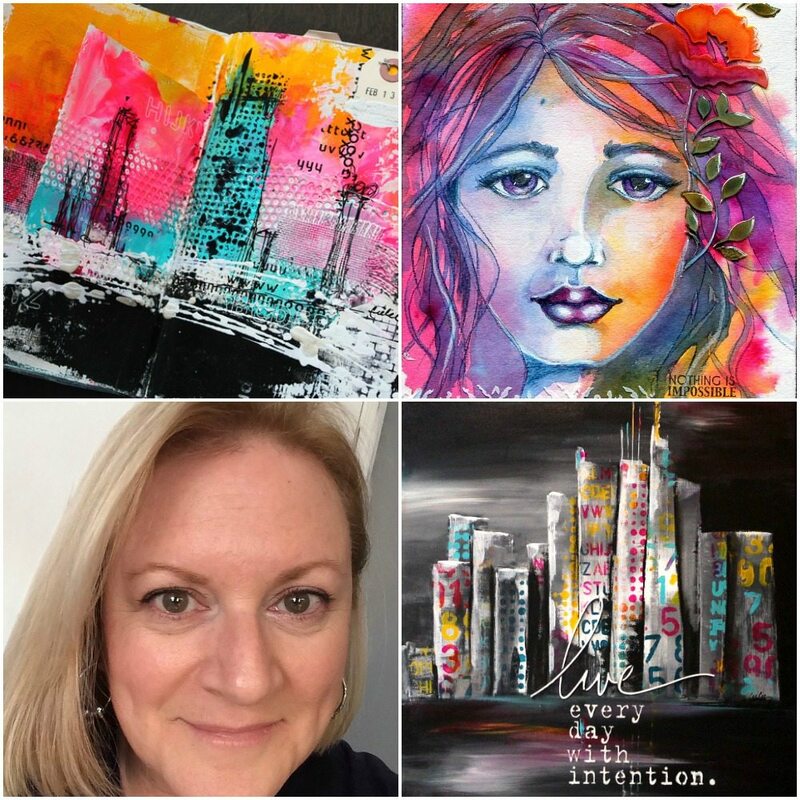 I’ve always been fascinated by symmetry, repetitive patterns, geometric shapes because they offer so many opportunities for interpretation.” This workshop will have you look at your stencils and stamps in a whole new way. Learn how to read geometric shapes such as squares, triangles, circles, stacked lines to turn them into flowers, landscapes, buildings, people, and so much more. Create unusual art journal pages with contrasting elements against free-flowing and colorful backgrounds. Embrace the versatility of basic shapes and let your imagination take over. Oh the possibilities! I like to think that my moodiness is just part of my charm. If others would agree or not is another story. But when it comes to making art, being moody always works in my favor. In Moody we will explore and use charcoal, graphite, a limited palette, and a handy-dandy kneaded eraser to embrace our dark moods as well as expose our light. Then, when the mood hits us, we’ll express them both exquisitely in our art journal. When we go on a trip or attend a conference, we’re often overwhelmed by the amount of information available and by the number of people we meet. Use an Illuminated Alphabet to quickly, colorfully and easily capture words related to your experience. This simple capture method allows you to gather inspiration in one place, and to practice your lettering too. When you look over your completed Illuminated Alphabet, letters and words will illuminate the things that were important to you. This fun and simple capture tool can be played in many ways, by individuals or in groups. I love telling a story with a simple line. I love a life story to be read in a single mark. I love lines that are expressive and that pull on your soul. My favorite tool for creating lines like this is the Stabilo All pencil. I have long called the Stabilo All the “magic” pencil, because it makes you look better than you are….it’s magical! It can be delightful to use, but there is a learning curve. In this lesson we will work on using the pencil to develop expressive marks. We will push on the pencil, pull back on the pencil, and work on creating powerful, expressive lines. Then we will turn those lines into scribbles and sketches that tell an expressive, meaningful story. We will work our magic with the magic pencil over watery, ethereal acrylic backgrounds. 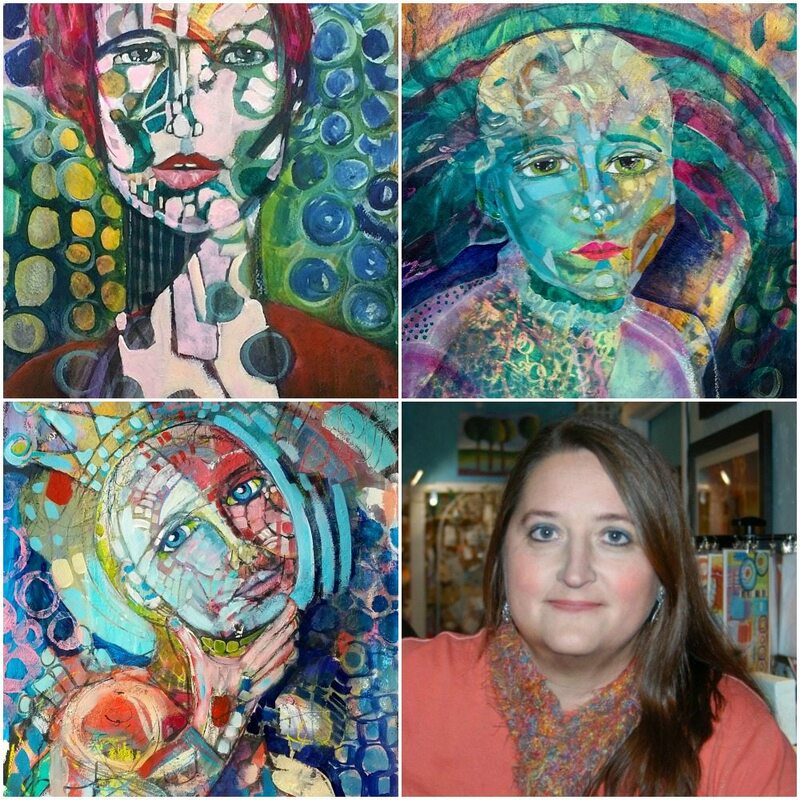 This workshop is about play, expression, and pushing yourself to be more expressive than ever. When describing tango to someone who doesn’t know what it is, the words used are: dynamic, sensual, fascinating, playful, romantic, improvisational, elegant, fun, challenging, transcendent, accessible, clear, vivacious, luscious, graceful, refined, awesome, sublime, frisky, lively, captivating, alluring, intriguing, delightful, pleasurable and mysterious. That is exactly what I would say about tengucho paper and what it is you can do with it in mixed media! Creative enthusiasm is all you need. So please put on some music and join me in this dance to creativity! We all are a thousand different people in any one moment- mother, sister, friend, wife, photographer, lover, creative, artist, seeker, juggling a squillion different things- fragmented and divided. 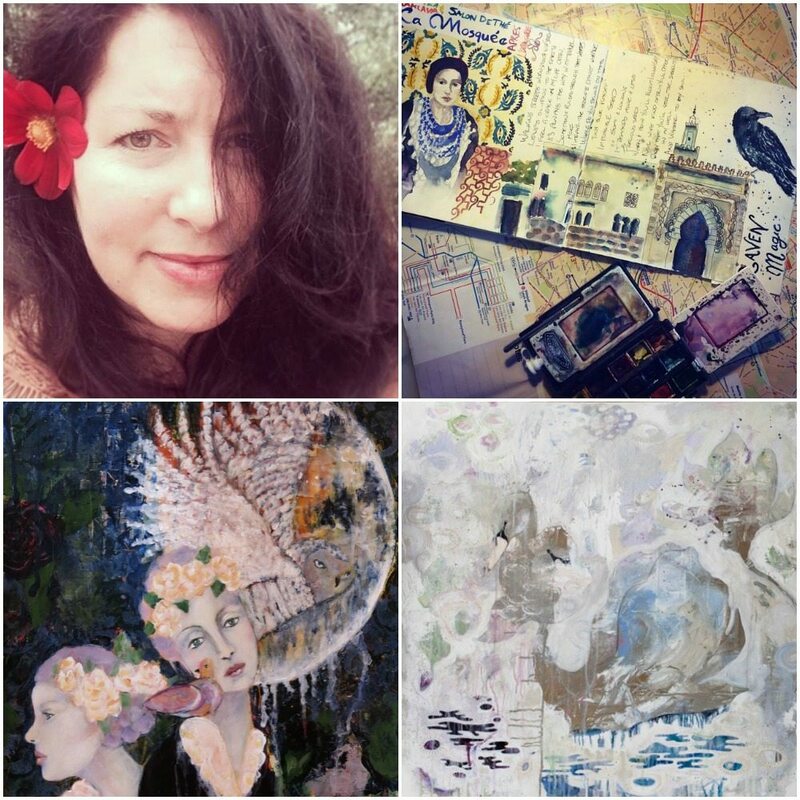 In this workshop we will be playing with the fragmented nature of our identity through photography, collage, writing and painting in our journals, exploring, pulling apart and piecing back together in order to collected bits of ourselves for integration as Self. Using the beautiful array of Martha Stewart Craft Paints we will be selecting a limited but harmonious color palette that will guide us through a mixed media art journaling spread incorporating, collage papers, vintage ephemera, stenciling, magazine images and ink. Our color palette will convey and connect the story woven into the spread as we explore the meanings, symbolism and emotion tied to color. Tissue paper is an inexpensive and versatile collage material. It can be used for so many things – to create a lightly textured first layer, which can then be painted, or as an overlay. It is very fragile, however. 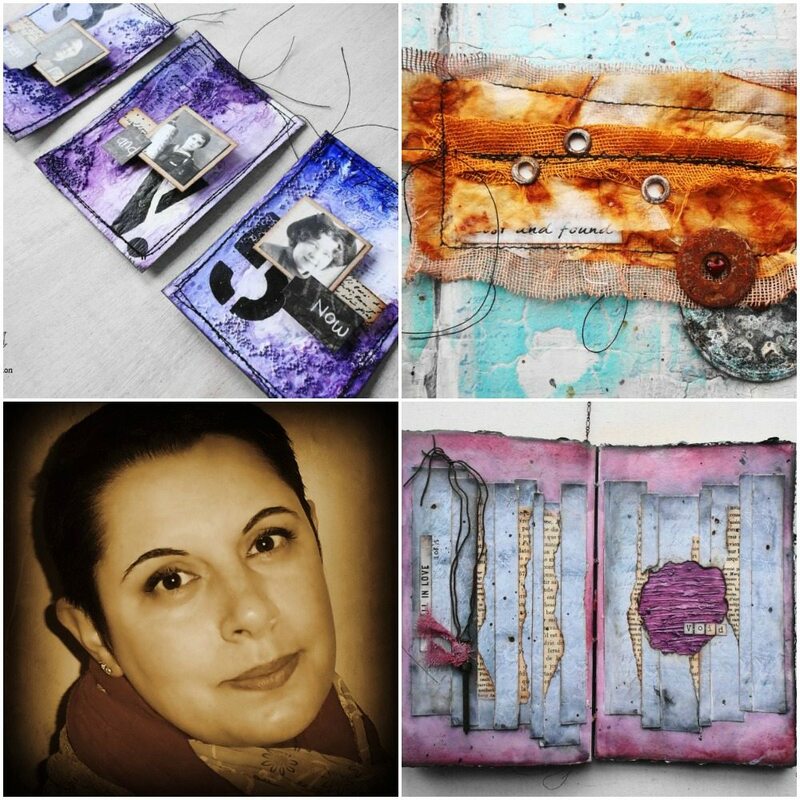 In this workshop, we will learn different ways to strengthen this delicate supply and use it to create beautiful, translucent, transparent embellishments for your art journaling or mixed media projects. A little known ‘secret’ of mine is that long before I started diving into the wonderful world of mixed media art, my main medium was drawing pencils and watercolors. Simple tools without a lot of bells and whistles. I found when i combined watercolors with drawing mediums, magic would happen in unpredictable ways. Flash forward a few years, I have added a few new tools and techniques to my water color play such as water soluble pencils, pens, shimmering water colors and more. 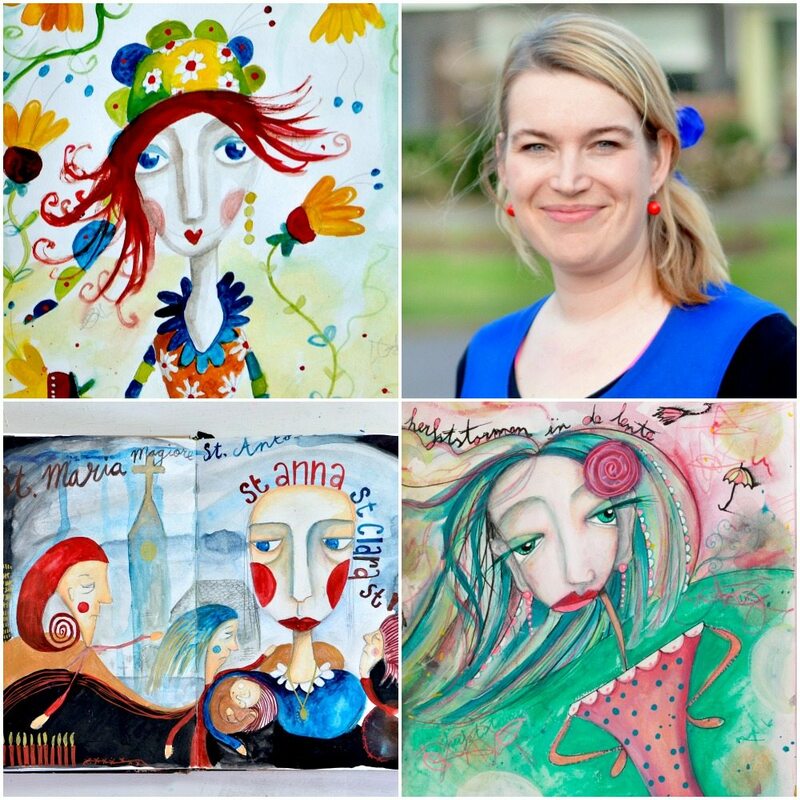 In this workshop, I will take you back to the basics with a bit of mixed media flair as we work on painting facial features in little ‘bite size’ pieces. We will leave the pressure of working on a whole portrait for another day and just focus on a few of my favorite parts of the face (eyes, nose, and lips) in a variety of styles. Place these bits in your journal or perhaps frame your handiwork in simple fashion. Grab your watercolors and let’s get ‘flowing’! In college I took a semester long class called “Marker Rendering,” it was geared towards Advertising Design majors to teach us how to add color to our hand rendered concept boards and ad layouts. It was a lot like painting, but faster. Low and behold by the next semester that class was canceled due to the new classes utilizing the computer. I recall thinking to myself, “Well that was fun, but I’ll never use this skill again.” Fast forward 20 years, lo and behold I now covet my collection of markers. 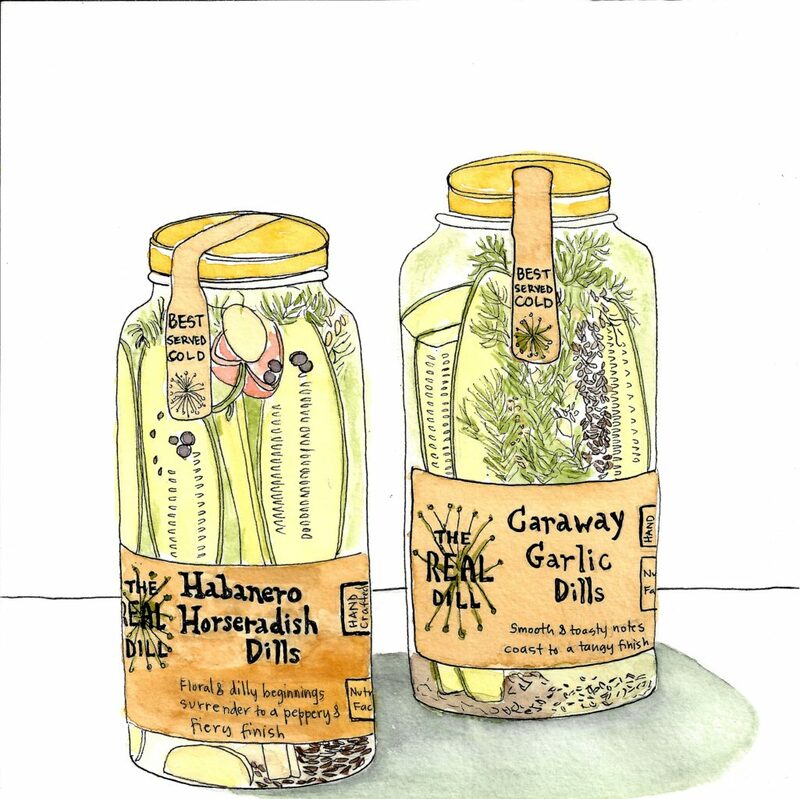 They are one of my favorite tools in my art journaling bag. In this workshop I will share with you my favorite markers, Faber-Castell Brush Markers. They truly are magical! 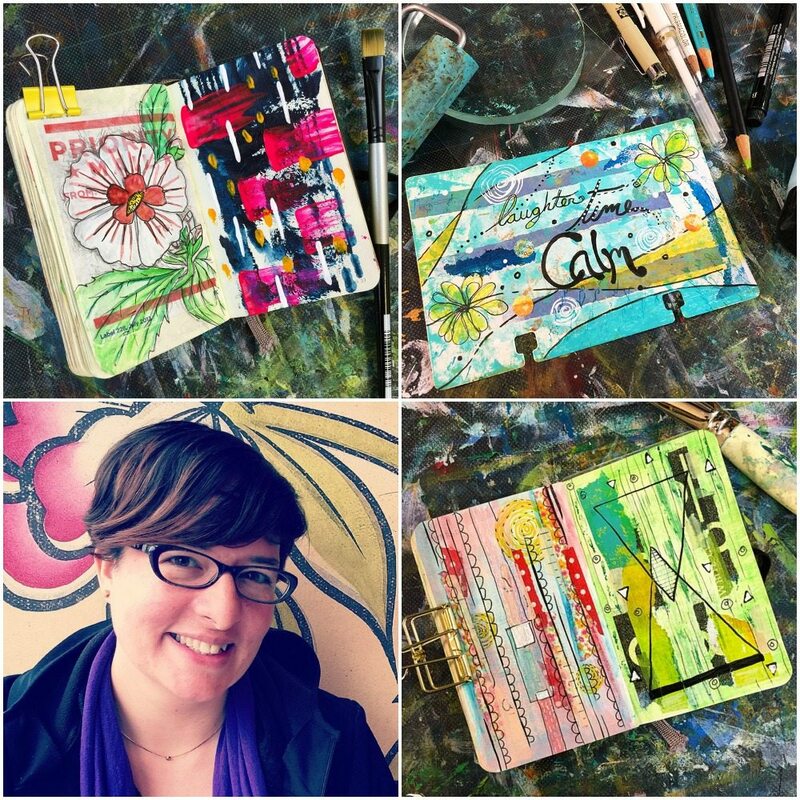 I will demonstrate the many different ways I use them in my journals – from straight forward marker use in lines and blending, to using them with mixed media, to creating watercolor quality images. Watercolor is such a versatile type of paint. And it is perfect for art journaling. Especially when you love to journal on the road, while traveling or if you have little time or space. In this workshop I will show you different watercoloring techniques. You will learn how to doodle with watercolors, how to art journal with only watercolors and a bunch of pens and a pencil. Also I will show the difference between watercolor, liquid watercolors, inks and gouache. 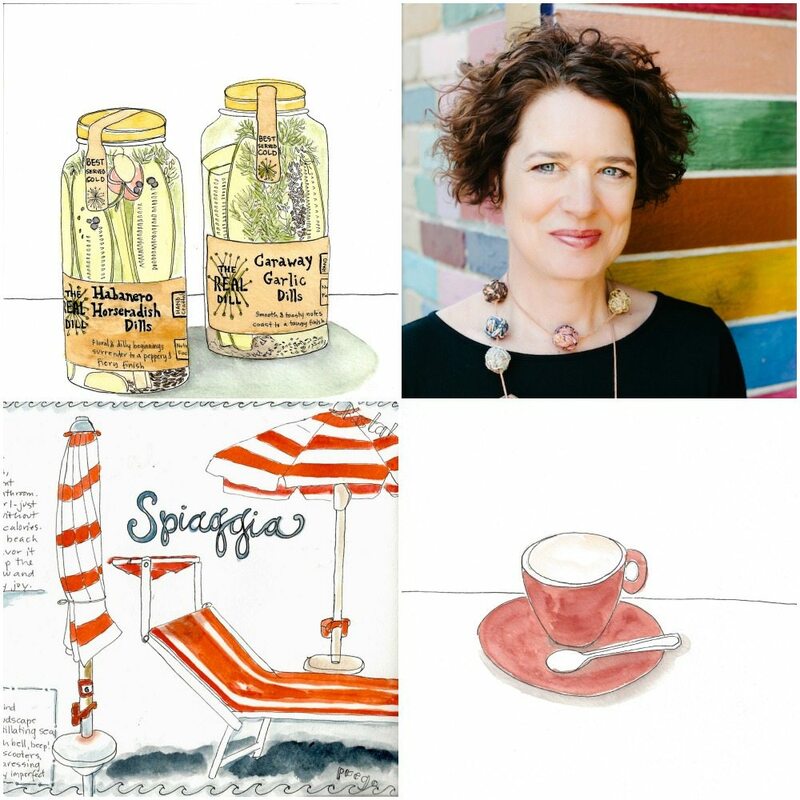 After this workshop you will know many watercoloring techniques, the differences between brands and types of water color, how to use them with confidence and most of all, you will have lots of inspiration for years to come. 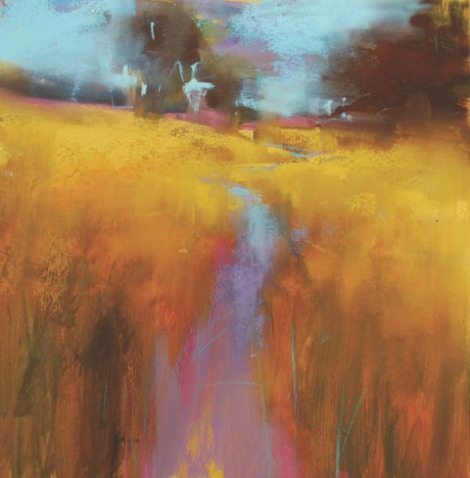 Whether it’s watercolor, fluid acrylics, sharpie drawings or pan-pastel, an under-painting can make the process of pastel painting more rich and FUN! Start with an abstract beginning or stay faithful to your subject. Play with compliments or use the colors that you see. There are endless ways of approaching the under-painting and all of them can lead to a new kind of painting experience that opens up possibilities in your work. 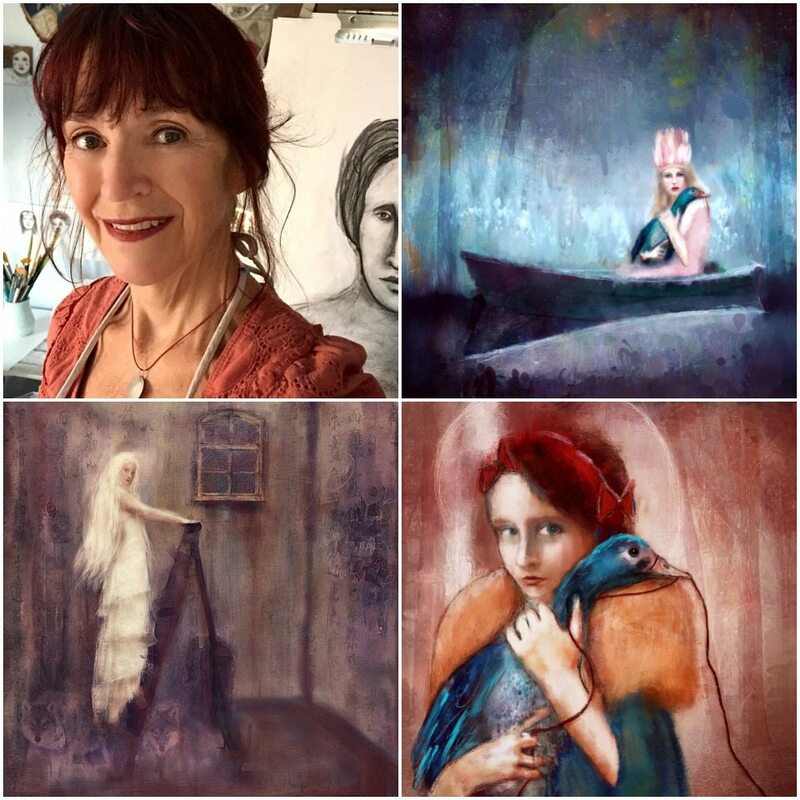 Come and play with me as we use a small format to create a series of pastels that you’ll have as a wonderful reference to inspire you to new and unexpected territory in your work. 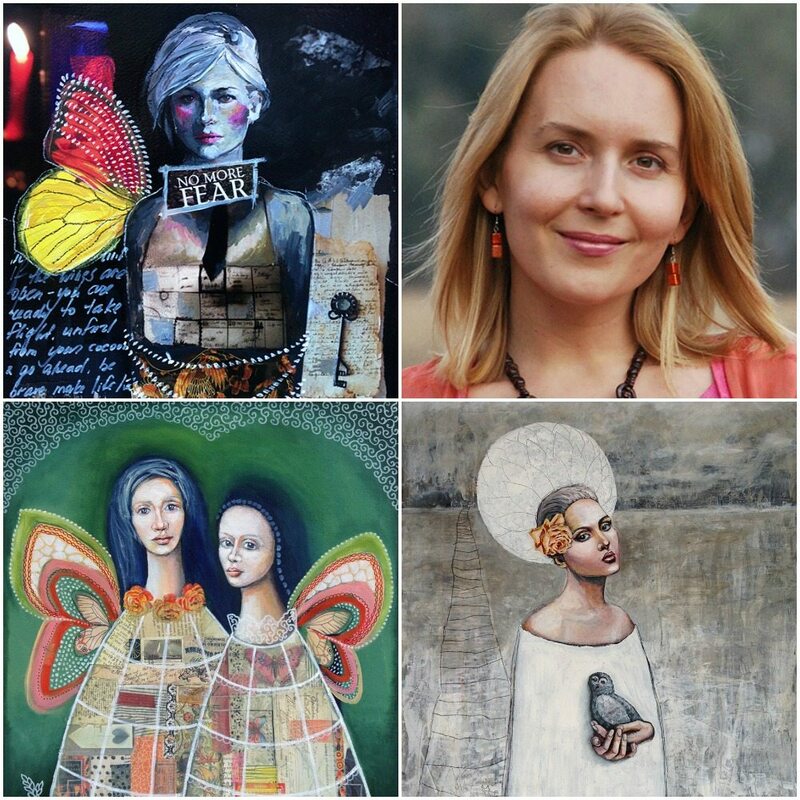 This workshop is about understanding what your soul is searching for and giving it a voice. 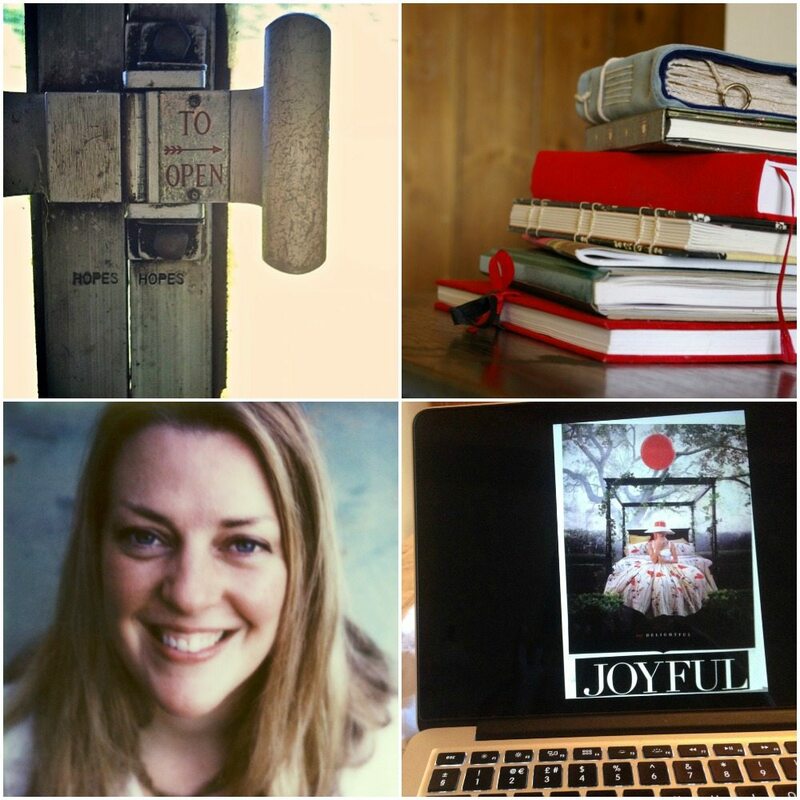 Using simple tools such as guided writing, cut and paste, and journalling, together we will release all of the soul energy that is stored away on your hard drive. So many people have bought and paid for e-courses, pdfs and ebooks and either started but never completed them or never even opened them up in the first place. Now they are just a collection of to-dos or – worse – a whole folder of self-doubt and shame. Well no more! Those unopened, unfinished things are simply messages from your own soul. It wants something. It is asking for something. It needs something. Together we will release the energy stored up on your hard drive, liberate you from the tyranny of unclicked icons, and show you what your soul has been asking for all along. Pixels To Paper- expanding your creativity and imagination with the iPad! 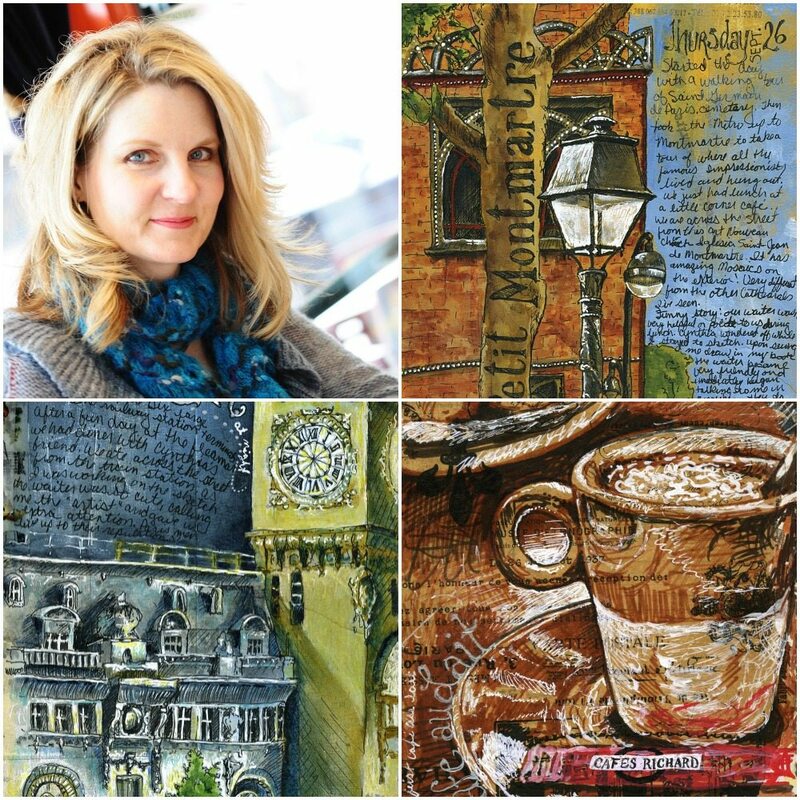 By incorporating the power of the iPad your art journaling practice will truly expand! We will be using creative apps like Procreate to compose beautiful and intricate elements that will then be printed out and incorporated into an Art Journal spread. We will explore design, composition, color choices using meaningful art journaling themes before we even get out our paints to create a spread! Nature is inspiration for the eyes, ears and soul. 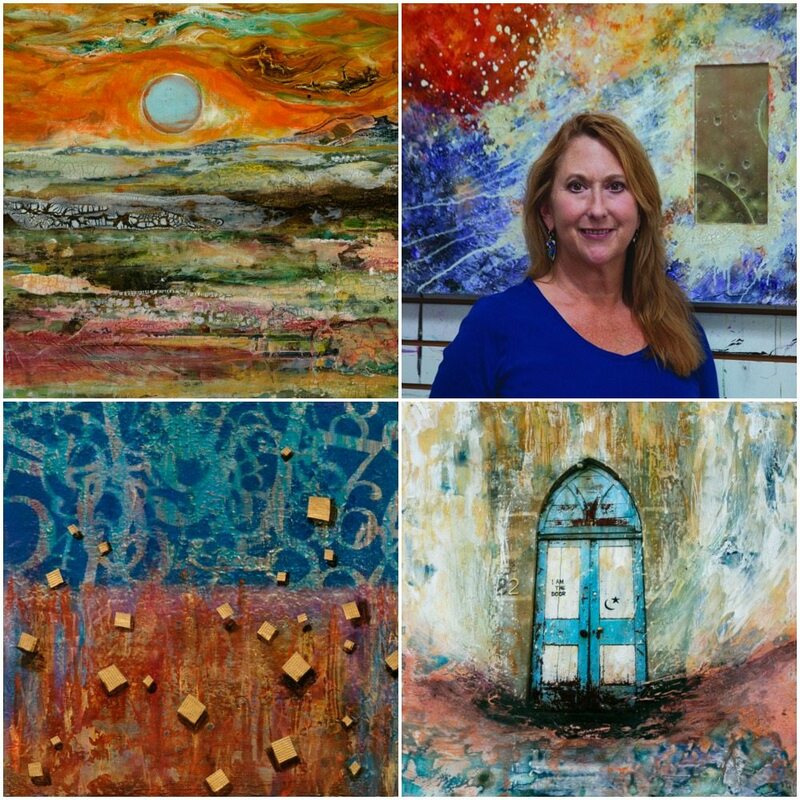 I love to work with earth pigments, plaster and crackles. I have experimented with many different types of crackle products and plasters and I will show you how to use them on different surfaces. Plaster and crackles are not meant for paper but you will learn the tricks to get them to stay put. I am very excited to be here sharing these tools and techniques with you. 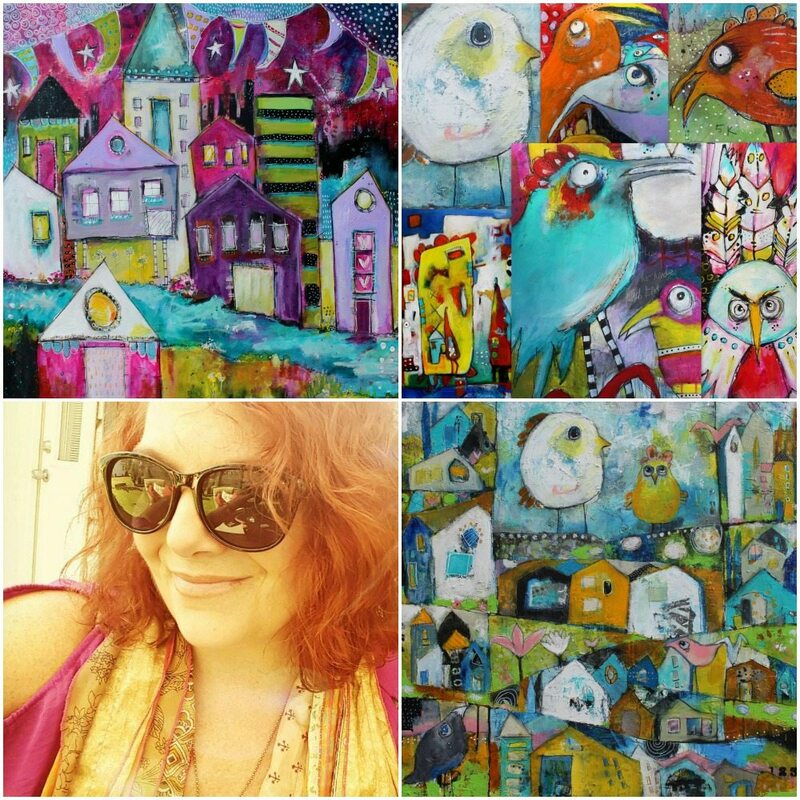 I am a mixed media artist and the techniques we will cover in this class may be adapted to many different surfaces. It is all about the process. The crackle products are the result of a flaw in the material. I love this because I think the most beautiful things in life embrace everything, including the cracks and chips. In this course you will learn how to get crackles to stay on paper, which ones go on rigid surfaces, how to get clear crackles and how to put a transfer on top of crackles. In this workshop I demonstrate how to make a journal that holds ‘secrets’ a scrappy fabric journal with pockets and explore the unique qualities of ‘loose page journaling’ Don’t worry if you are not savvy with a sewing machine, the techniques I employ are basic but fun, offering endless creative possibilities. Unleash your Style: Layers, Colors, Textures and Tools! 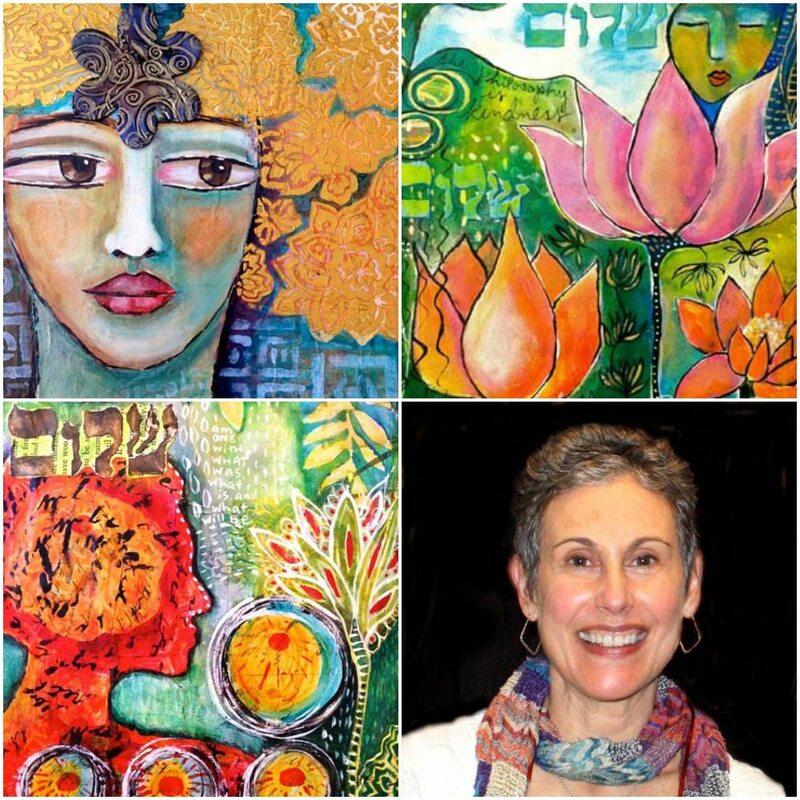 This workshop will focus on the theme of Unleashing your creative style by using Layers, Colors, Textures and Tools! We will start with creating marks, lines and shapes, I will not only talk about how to make them but also how to make them personal to you. 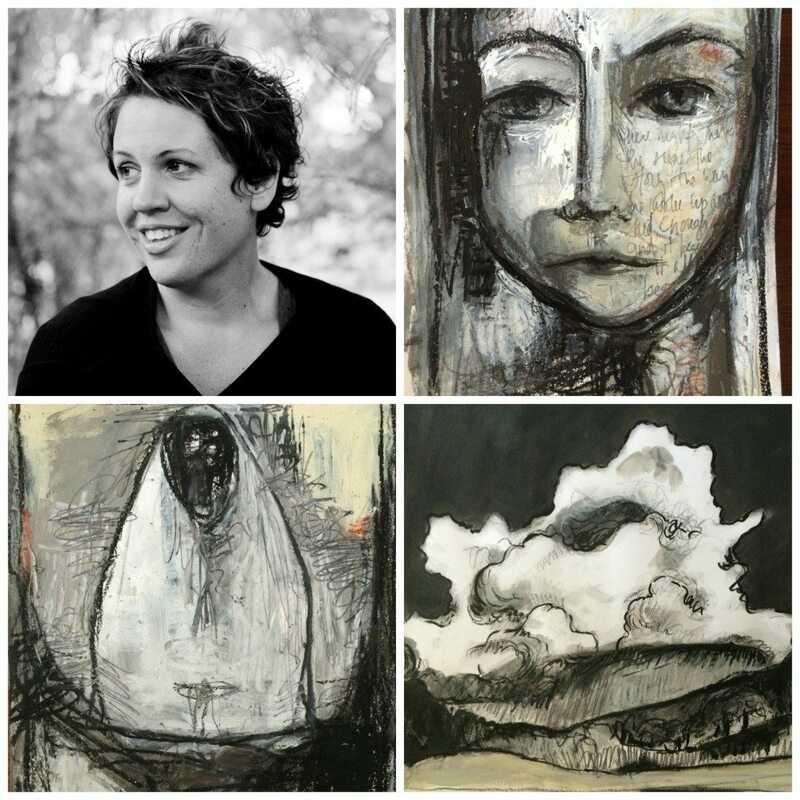 This workshop includes a review of basic drawing techniques and info on creating a visual library/reference that you can use later for creating more final work. 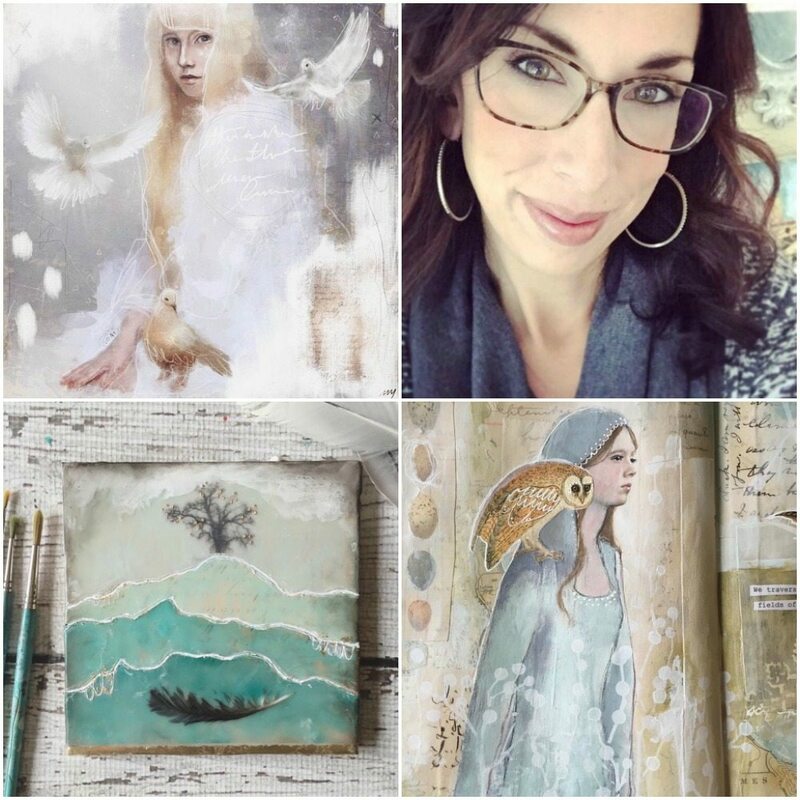 I will also show my favorite tools, art supplies and techniques and then guide you through the process of using your newly created “library” to make a finished piece. 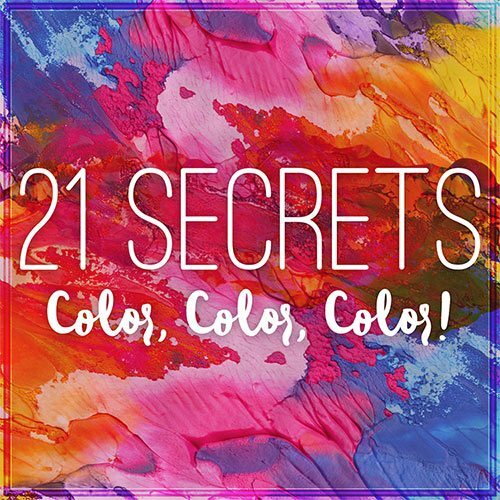 During my video series you will learn basic color theory, mixed media techniques, what supplies and tools I love to use and how to use them as well as my process for selecting colors, creating harmony through shape repetition and basic hand lettering techniques. 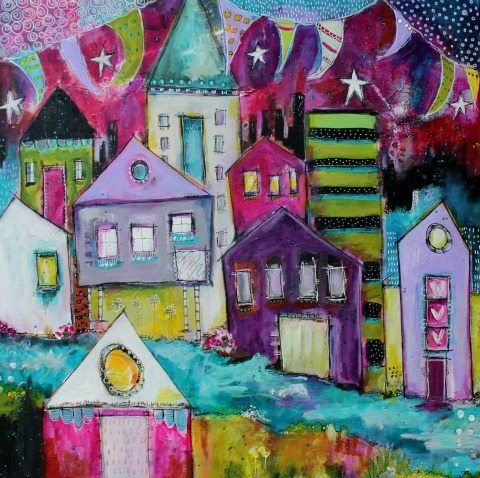 In flip, flop and fly we’ll be exploring how much fun you can have adding dimension and variety to your art journal pages by using tip-ins and flaps. 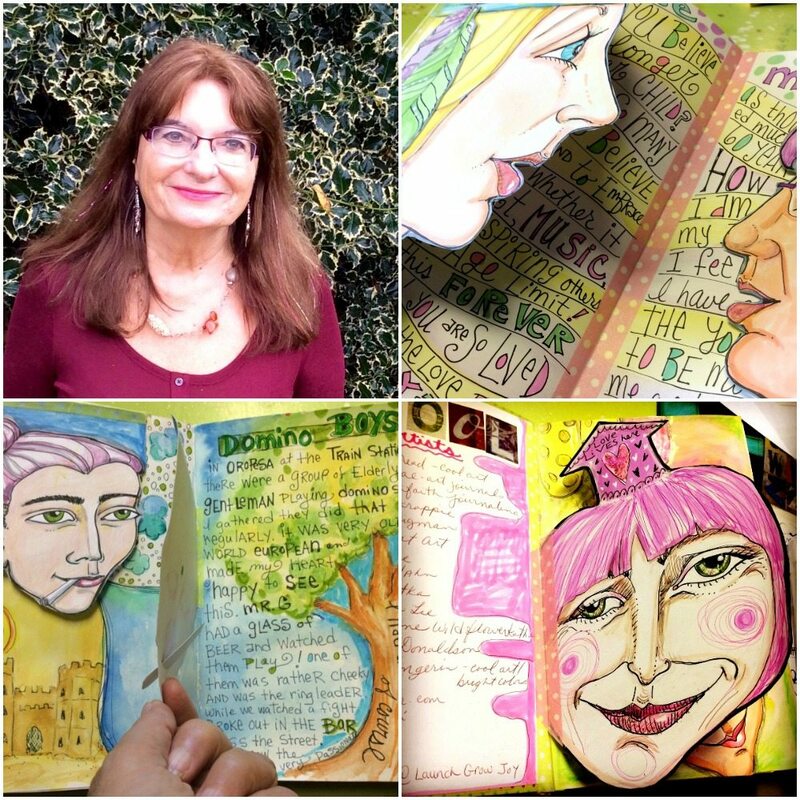 You’ll learn how to attach the flaps to your pages and also how you can deepen your dialogue with the journal page. You’ll also come away with ideas on what to create as a flap. The opportunity to learn a variety of art journaling tools and techniques from the comfort of your home/studio. Nope! Noway! Nada! 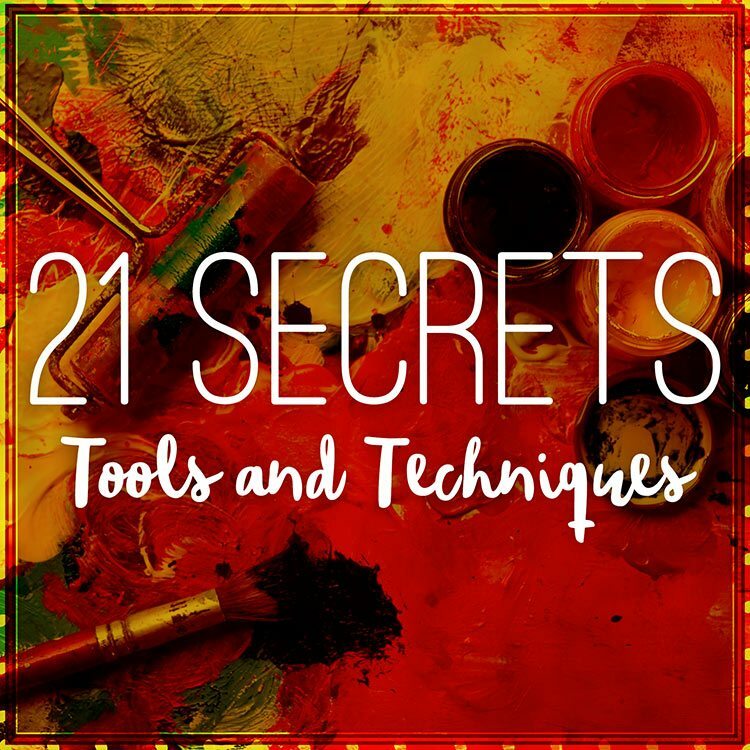 The beauty of art journaling is that it’s for everyone — and what makes 21 SECRETS Tools and Techniques even more delicious for a newbie is that the teachers will be introducing you to actual tools and techniques that will be hugely useful as you begin your journey as an artist. 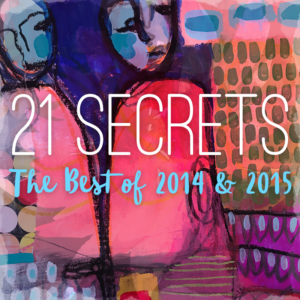 Check out these 21 SECRETS too!